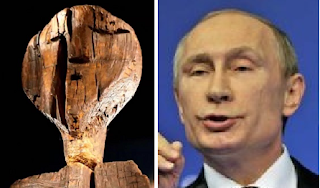 In Russia there is a mysterious wooden statue covered with pictographs and faces called the Shigir Idol. It was discovered in Western Siberia in 1894, having been preserved for years in an old bog. Scientists have always known it was ancient, but through various modern gizmos they have now discovered that actually it's the oldest wooden sculpture in the world -- carved 11,000 years ago! Nobody knows what the markings hacked into it mean, though most every expert insists they were intended to communicate unfathomable mesolithic knowledge, as opposed to, say, just being some whittlin' to fight off the mind-numbing boredom of prehistoric Siberian nights. For all we know this may be their god of monotony and despair, worshipped in the name of nothing else to do. The fact that the idol is the height of a 2 story building shows the central place tedium held in their world.